Bruce Carr aka No Ordinary Balloon Man is a professional award-winning balloon artist currently living in Clermont, FL serving the Central Florida area and beyond. He has had a life long love of all things in the realm of what he calls "nerd swag" and there is nothing that he enjoys more than making people smile. This professional balloon artist has been making balloons since the age of twelve. 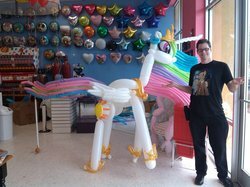 Bruce has entertained and built balloon creations for companies such as Disney, Wal-Mart, Kennedy Space Center, Geico, Build-A-Bear, Dunkin Donuts, Belk and Chick-fil-a. Bruce is also a full time balloon artists for a multitude of restaurants including Chuy's, Joe's Crab Shack and Texas Road House,through the balloon art companies Twisted Artz and Balloon World Orlando. He is also an entertainer for parties and events throughout Florida and the Eastern United States, including Colossalcon in Ohio, Screw Attack Gaming Convention in Texas, Mobicon in Alabama and many more. Bruce combines balloon art, acting, singing and puppetry to construct beautiful lightweight costumes to delight attendees of any large event. Bruce has even won costume awards at the Florida Supercon, Holiday Matsuri, Omni Expo, Ultracon and Chibi Pa, becoming a fan favorite at many fandom conventions. Bruce's work has been recognized in social media and made into countless memes featured on such websites as Kotaku, MTVgames and Know Your Meme (Balloon Solid Snake and Balloon Colossal Titan) Equestria Daily (Balloon Party Favor Pony and Balloon Bridge) and Cartoon Network (Balloon Finn and Jake). As a performer, Bruce has collaborated with other amazing artists for unique balloon performances with Grammy Nominated punk rock band Green Jellÿ and with Pecach Pictures "Pony Meets World"as "Human Discord". Bruce has recently had large balloon projects sponsored by Qualatex, the world's leading balloon art company. Bruce encourages individuals with Asperger Syndrome to pursue their goals and dreams via his panel "Twisting Up the Odds", performed at The Hartwick Symposium and other conventions. He also supports terminal kids in need with the Children's Miracle Network via The Grand Brony Gala.